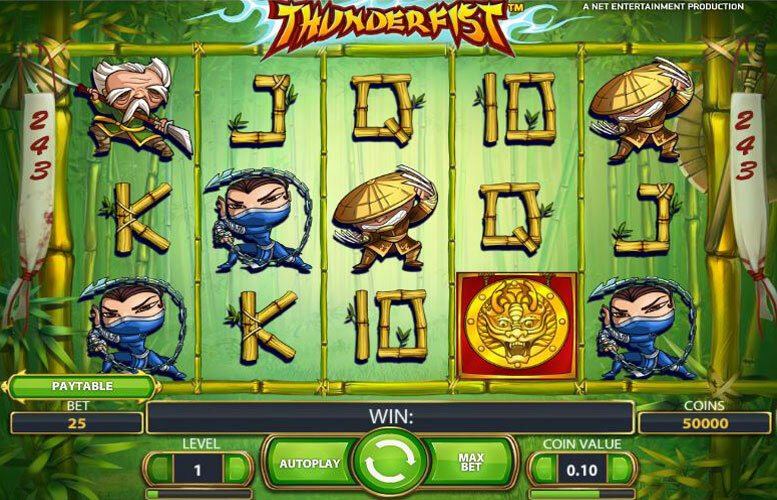 You won’t be shaking your fist at this game if you manage to land yourself the 1,215,000 coin top jackpot prize! 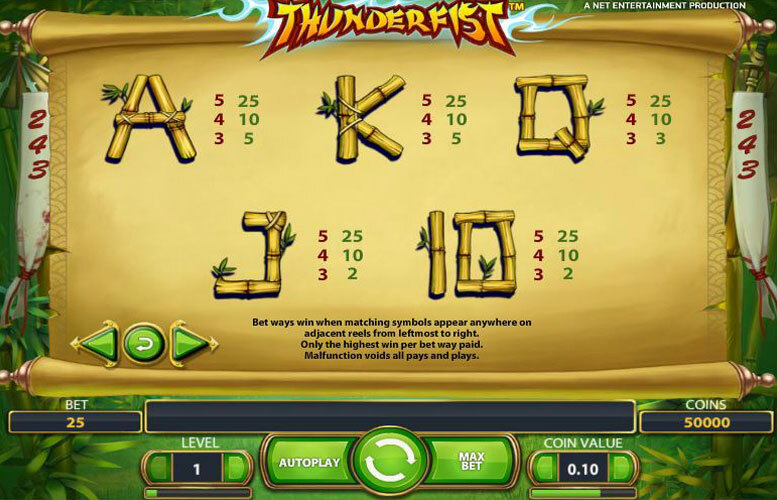 The Thunderfist has one of the biggest payouts in all of slot gaming and with a wild and scatter which triggers free spins and a multiplier it’s one you should be playing. If anyone is looking for an unusual slot game, this is it: this five reel slot features oriental music, chirping birds, and running water as the sound in the background which can make for some very relaxing play. The game works on bet ways not paylines with a total of 243 being available which, as you might have guessed, leads to more frequent winning spins. Other cool features include free spins rounds which have a random multiplier attached and there’s also a stacked wild symbol to look out for. 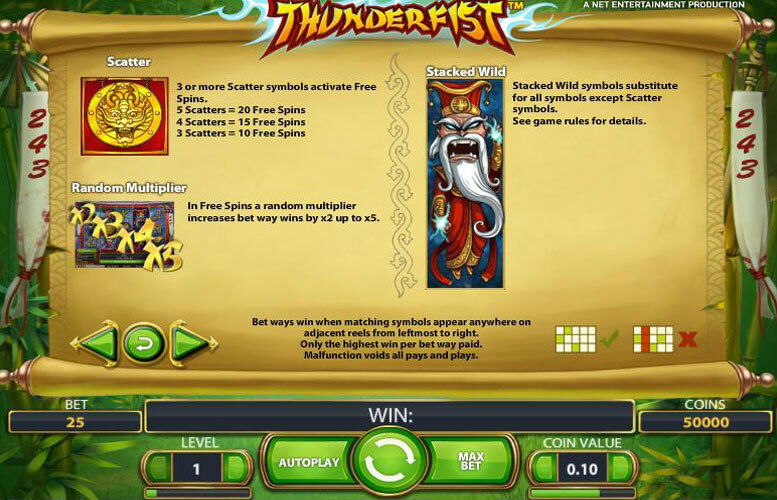 Sadly, the game does not pay out for combinations of wild symbols and they don’t double wins or anything, so it’s the scatter symbol which holds the most value. While the game does look nice, it is also very slow. This is probably why they included a quick spin option to speed the reels up, to use this just hit the spin button while the reels are spinning to stop them. To get this payout you need to spin in the Red Ninja (which pays 100 coins for a comobo of five) across all 243 bet ways when you win’s are multiplied by x5. The maths is 100 x 243 ways = 24,300 x 5 (multiplier) = 121,500 x 10 (bet level) = 1,215,000. Max coin value is 0.50 so the biggest money payout would be £607,500. Scatter: The scatter is a dragon and it does not award players for spinning three or more of them with a bonus. Instead, players only get 10 free spins for three, 15 spins for four, and 20 spins for five. Each free spin will have a random multiplier between 2x and 5x per spin. Wild: This symbol is odd in comparison to other slot games. First of all, it is a stack wild, meaning it will either take one, two, or all three spots on a reel. They can occur on any reel. Sadly, they do not award players on their own or even multiply the wins it does make. It is depicted as an evil looking emperor with lightning surrounding him. Red Fighter: This guy does his fighting with only his hands and offers the highest payout. He pays out 1,000 coins for getting five of him in a row and 250 coins for four in a row. Players win 100 coins for spinning three in a row. Pink Girl with Fan: This dainty looking girl will pay 100 coins for three and 200 coins for four. There is an award of 750 coins for spinning a full payline. Old Man with Staff: This icon will pay 500 coins for five in a row and 200 coins for four in a row. It will also pay out 100 coins for spinning three on a payline. Blue Ninja with Chain and Old Man with Claws: This is the most ninja looking character and uses one of those chain weapons that work kind of like a whip. The other is an old man that has metal claws that are reminiscent of Wolverine from the Xmen. They share equal payouts with 100 coins for three in a row, 150 coins for four, and 500 coins for five on an active payline. Bamboo A and K: These bamboo letters happen to share equal payouts as well. Players are awarded 250 coins for a full payline of matching icons and 100 coins for four. They will pay 50 coins for three in a row. Bamboo Q: This pays the same for combinations of four and five as the first two letters. Spinning three however only pays 30 coins. Bamboo J and 10: The final symbols of the game will pay 20 coins for combination of three. It awards the same amount for four or five as the rest of the letters. 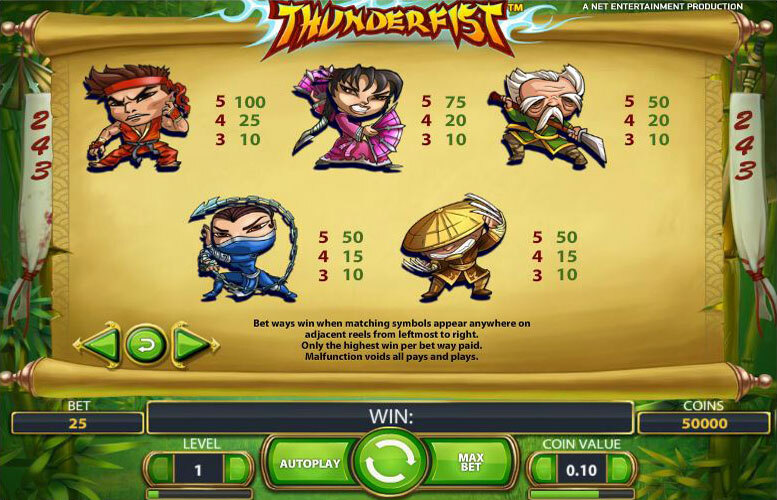 Players can choose a coin value of 0.01, 0.02, 0.05, 0.10, 0.20, or 0.50 to use for their bets. There are ten bet levels and it costs 25 coins to play all the 243 bet ways. This makes the total minimum bet start at 0.25p and the maximum total bet £125. This game has a rating of 5 / 5 with 524 total reviews by the users.